New Moore Island or South Talpatti ( Known in Bangladesh) was a small uninhabited offshore sandbar landform in the Bay of Bengal, off the coast of the Ganges-Brahmaputra Delta region. It emerged in the Bay of Bengal in the aftermath of the Bhola cyclone in 1970, and disappeared at some later point. For nearly 30 years, India and Bangladesh have argued over control of a tiny rock island in the Bay of Bengal but later in 2010 the rising sea levels have resolved the dispute for them: the island's gone. 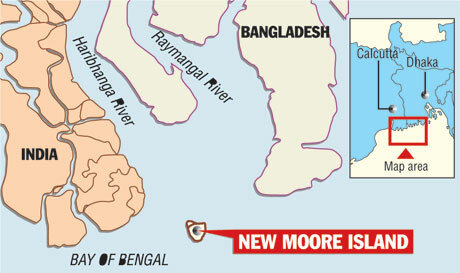 New Moore Island, in the Sunderbans, has been completely submerged, Its disappearance has been confirmed by satellite imagery and sea patrols. Scientists at the School of Oceanographic Studies have noted an alarming increase in the rate at which sea levels have risen over the past decade in the Bay of Bengal. Although the island was uninhabited and there were no permanent settlements or stations located on it, both India and Bangladesh claimed sovereignty over it because of speculation over the existence of oil and natural gas in the region. The Resolution: In Permanent Court of Arbitration (PAC) the dispute was settled in July 2014 by a final verdit not open to appeal and in favour of Bangladesh. The Permanent Court of Arbitration (PCA) verdict awarded Bangladesh with 19,467 km2 out of 25,000 km2 disputed area with India in the Bay of Bengal. 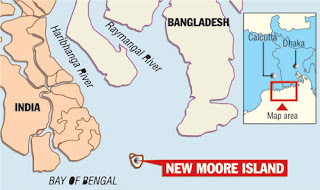 However New Moore Island (or South Talpatti Island to the Bangladesh) has fallen in India`s part of the Bay of Bengal. In 2014, External affairs ministry spokesperson Syed Akbaruddin said "We believe that the settlement of the maritime boundary will further enhance mutual understanding and goodwill between India and Bangladesh by bringing to closure a long pending issue. This paves the way for the economic development of this part of the Bay of Bengal, which will be beneficial to both countries," the spokesperson added. Bangladesh has also welcomed the ruling. According to reports from Dhaka, Bangladesh`s Foreign Minister A.H. Mahmood Ali said in a press briefing that it was a "victory for both sides".